2. Can Kelly thrive outside of Mike D’Antoni’s system? Kelly became a perfect match for D’Antoni’s coaching philosophy that puts a high emphasis on having so-called “stretch fours” that can hit outside shots, space the floor and play multiple positions. So with D’Antoni resigning in late April, how will Kelly fare without him? Kelly immediately pointed out that he believes he can thrive under any coach, attributing his 8.8 points per game average his rookie season toward a strong basketball IQ, consistent shooting and versatility. Certainly, those are all fundamental qualities that can translate into any NBA system. But it will still be interesting to see if Scott will grant Kelly as many opportunities D’Antoni afforded Kelly, for reasons that included D’Antoni’s system preference, a plethora of injuries and Kelly taking advantage of his time. 3. How much will Kelly’s physicality improve? It appears that Kelly has taken his exit interview pledge to bulk up his size pretty seriously this offseason. According to his Instagram account, Kelly spent a good chunk of his offseason bulking up. So much that he even took part in MMA training. It’s a good sign Kelly worked on this area considering the Lakers and Kelly himself both acknowledged he needed to improve in that area after seeing bulky big men power him at times. Granted, no one will expect Kelly will become an enforcer. Nor should he be. But addressing this issue could go a long way in helping Kelly establish more of a post game and size up against strong power forwards. 4. 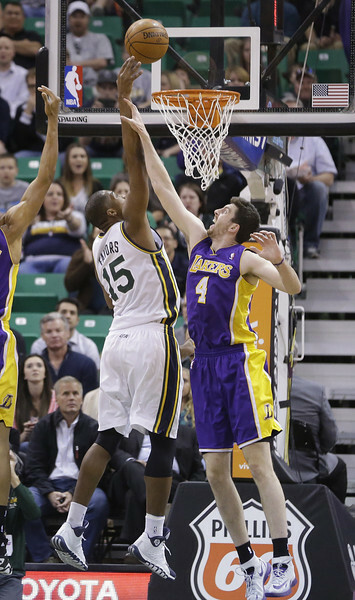 The Lakers will sorely need Kelly’s shooting. Still, Kelly’s main strength will need to involve his shooting. For all the focus centering the health of Kobe Bryant and Steve Nash, another huge factor determining the Lakers’ success will entail the team’s outside shooting. The Lakers lost a strong post presence in Pau Gasol, making it uncertain that the Lakers can rely as much as they did inside. The Lakers lost their most prolific outside shooter in Jodie Meeks. So how do the Lakers ease the burden on Bryant? Kelly could become that answer. But as promising as he looked from the perimeter last season, Kelly will need to bank more than 33.8 percent from three-point range. As much as he wants to still score at a prolific rate, Bryant will gladly facilitate IF he finds his teammates are capable of carrying the workload. But if Kelly, or anyone else for that matter, cannot fill that role, Bryant will try to take care of the job himself, both for better and for worse. 5. What defensive role will Kelly play? Partly because of his physical limitations, Kelly rarely thrived when he defended some of the opposing team’s top scorers. Yet, Kelly could play a valuable part in bolstering the Lakers’ defense, namely because he has the basketball smarts both to keep the unit organized, draw charges and hustle for loose balls. This entry was posted in Kobe Bryant and tagged Ryan Kelly by Mark Medina. Bookmark the permalink.